As you can see, this month’s rise was led by department stores (+2.2%), cafes, restaurants and takeaway food (+2.0%), and “other” retailing (+1.0%), whereas sales actually dropped in food retailing (-0.7%) and clothing, footwear and personal accessories (-0.1%). 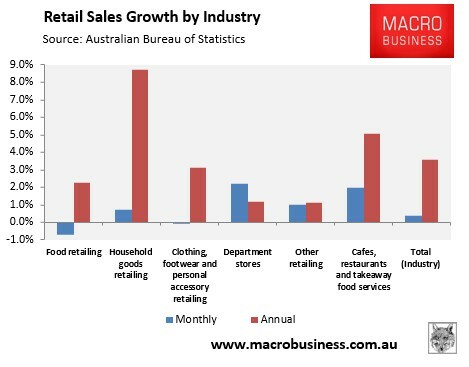 On an annual basis, household goods retailing (+8.7%) clearly led the charge – no doubt assisted by the housing boom – followed by cafes, restaurants and takeaway food (+5.0%). 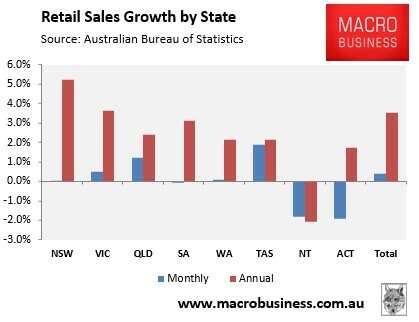 At the state and territory level, Tasmania (+1.9%) and Queensland (+1.2%) experienced the strongest sales growth over February, whereas the ACT (-1.9%), Northern Territory (-1.8%), and South Australia (-0.1%) went backwards. Over the year, the main housing ‘boom’ states of New South Wales (+5.2%) and Victoria (+3.7%) have lead the charge, with strong property price growth likely the primary driver (see next chart). 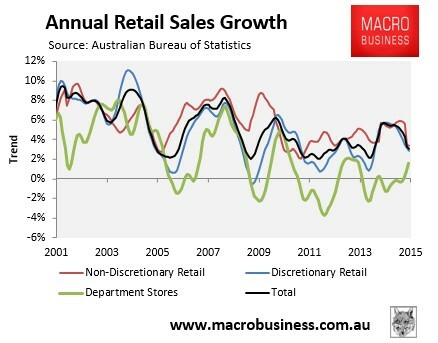 The next chart plots annual retail sales growth in trend terms, and shows sales growth falling away sharply in discretionary and non-discretionary retail, although department store sales are recovering (see next chart). 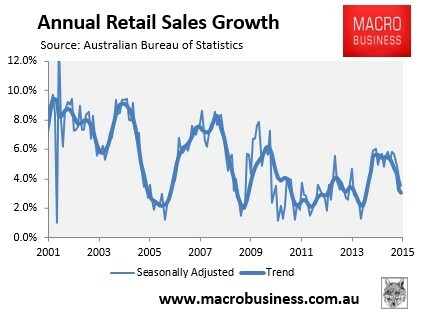 Retail sales continue to slow - MacroBusiness.